Description The process of finding out if the cancer has spread beyond the testicle is called staging. 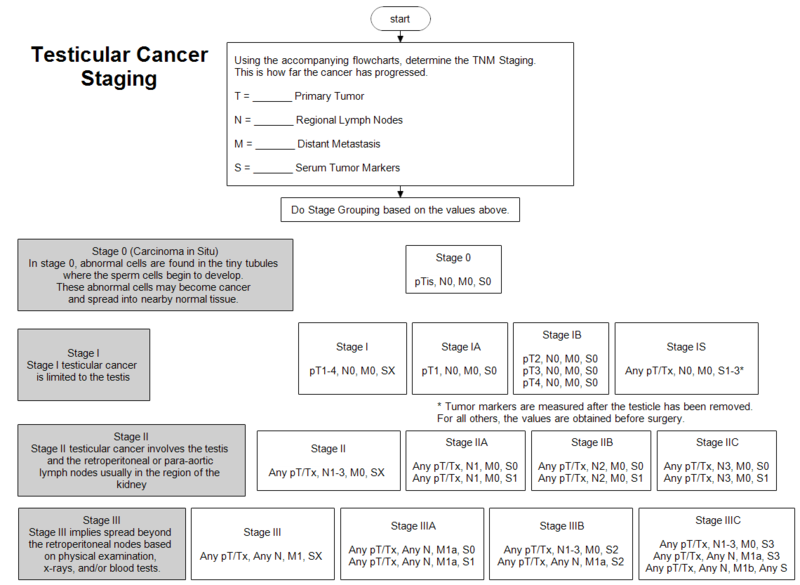 By using the accompanying flowcharts, you can determine the TNM Staging. This is how far the cancer has progressed. After determining values for TNM and S, you can use the chart above to assign a stage. The stage will be used in deciding the appropriate treatment for the cancer. Once RFFlow is installed, you can open the above chart in RFFlow by clicking on testicular-cancer-staging.flo. From there you can zoom in, edit, and print this sample chart. It is often easier to modify an existing chart than to draw it from scratch.